I enjoyed 2010's "Despicable Me" immensely, so I approached "Despicable Me 2" with a wary eye. "Despicable Me" told a funny, sweet, self-contained story about a guy named Gru (Steve Carrell) who renounces villainy and embraces fatherhood. It ended on a note that required no further speculation. Satisfied viewers like me sang "So Long, Farewell" to Gru and his crew. Reps at Universal looked at "Despicable Me's" $251 million dollar domestic box office gross and sang "Never Can Say Goodbye." So, another summer weekend brings another summer sequel. "Despicable Me 2" is as serviceable as it is unnecessary. Therein lies the rub for me. Here I sit on the fence between 2-1/2 and 3 stars, unsure of where I will fall. On the "thumbs down" side, there's dissatisfaction with a returning hero who is far blander than his original incarnation; he's been neutered by the one thing that made "Despicable Me"'s ending so satisfying. On the "thumbs-up" side is a series of clever touches made with love and attention by cast and crew. These moments are so good I almost feel despicable for being undecided. So this review is a battle between Evil Film Critic Odie and Emotional Moviegoer Odie. You have a luxury I currently do not: You can look at the star rating above and see who won. The opening of "Despicable Me 2" is an example of its brash cleverness. An entire intelligence team and their outpost is attacked by a huge horseshoe magnet straight out of that Warner Bros. cartoon subsidiary, The Acme Company. Almost everyone and everything is pulled comically into the sky and relocated, save for a port-a-potty and its terrified inhabitant. This act of vandalism attracts the attention of the AVI, an organization that tracks and reports the kind of villainy Gru partook in back in the days of "Despicable Me." The AVI sends out agent Lucy (Kristen Wiig) to ask Gru to use his powers of villainous deduction to figure out who's behind these extreme demonstrations of magnetic personality. Lucy's idea of asking nicely is electrocuting Gru with a "lipstick taser" before tossing him into the trunk of her superspy car-slash-plane-slash-boat. Before his Meet Cute with Lucy, Gru was living a boring, domesticated life. Now retired, the only despicable act he is perpetrating on society is a series of horrific tasting jams and jellies. It drives his colleague Dr. Nefario (Russell Brand) to resign and take a position with a new villain. Gru's new project will help his undercover operation as a vendor at the local mall. Lucy believes the mastermind AVI seeks is one of the other store owners at the mall. Suspects include a hairdresser, whose appearance conjures up images of "Shampoo" recast with Paul Williams, and an extremely masculine Mexican restaurant owner whom Gru thinks bears strong resemblance to a bad guy named "El Macho." Since El Macho es muerte (his death scene will put hair on your chest), Gru is immediately suspicious. Al Pacino was supposed to play Eduardo, the guy Gru thinks is El Macho. Al left the movie, but his accent apparently remained. Benjamin Bratt picks up the most over-the-top Hispanic accent since Tony Montana and runs a marathon with it. His line readings are a blast, though some viewers might find Eduardo somewhat politically incorrect. Whether Eduardo is El Macho isn't important; he brings much needed spark to "Despicable Me 2," upstaging Gru at every turn. In fact, until the climax, everyone upstages Gru. Carrell's accented line readings are still a pleasure, but I wanted more of the old Gru's scheming. "Despicable Me 2" does offer a few flashes of what endeared me to its hero in the first place. Gru's suspicions about Eduardo increases tenfold when his eldest daughter Margo (Miranda Cosgrove) feasts her eyes on Eduardo's teenage son Antonio (Moises Arias). Gru's amusingly unsuccessful (and rather mean) attempts to keep Margo from growing up have a familiar ring of disaster for any dad raising a daughter. Gru even brings his freeze gun out of retirement to cool Antonio's raging hormones, though he aims it at the wrong parts of this lothario. While Gru worries about Margo's love life, she and her sisters Agnes (Elsie Fisher) and Edith (Dana Gaier) worry about his, even setting him up on vHarmony (or whatever that dating site is that caters to the wrong side of the law). When Agnes sees Lucy, she correctly pegs that Gru has a thing for her. This potential Mommy subplot is designed to inject emotion into "Despicable Me 2." While it works for the most part (Agnes' big, expression-filled eyes are the animators' most glorious creations), nothing in the sequel comes as close to yanking my heartstrings as the moment when Gru, literally caught between the moon and New York City in the original, sees that pink ballet recital ticket floating in space. "Despicable Me 2" lags on occasion, but every time I found my attention waning, the filmmakers did something wicked to goose me. Many of these moments involve my second favorite thing about "Despicable Me," Gru's minions. The cheerful little yellow creatures with overalls become integral plot points this time, undergoing a Gremlins-style metamorphosis to the dark side courtesy of our mystery villain. This leads to a nod to Philip Kaufman's "Invasion of the Body Snatchers" that, dare I say, is worth the price of admission. 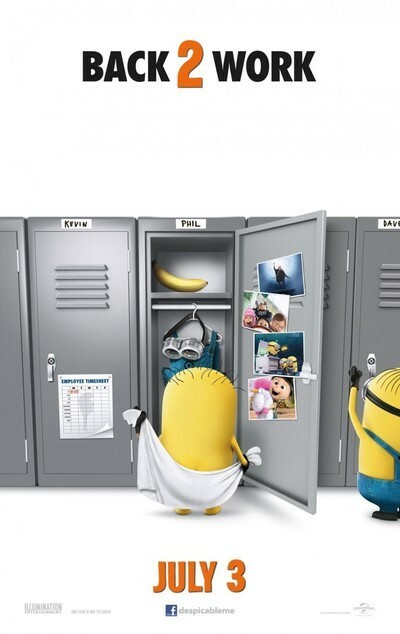 The minions also figure in the second dressed-in-all-white homage to '90s music to appear in a 2013 summer film. I laughed so hard I almost spat out my soda. It was at that moment that I found myself torn about my star rating. This is where you came in. While I remain disappointed that the sequel gives me a subdued Gru and an uneven pace, I keep remembering things about "Despicable Me 2" that make me smile. For every meh moment, there's almost 2 well-conceived gags or lines. The voice talent remains top-notch, with Wiig, Bratt, Steve Coogan and the returning Russell Brand as stand-outs. The 3-D, as far as I can tell, is quite good, especially during the closing credits. (Full disclosure: like some of Gru's minions, I've only got one working eye, which turns 3-D into 2.25-D.) Some of the minor plot points pay off big time. I'm as enamored of the Pharrell Williams songs in this one as I was in the first film (and they're well used). And directors Pierre Coffin and Chris Renaud, and screenwriters Ken Daurio and Cinco Paul milk a few sweet moments of genuine emotional heft from the relationship between Gru and his kids. With all that in mind, I have decided to award three stars to "Despicable Me 2." Besides, the Evil Film Critic has to win sometimes.